Craggs came back in and said there was a hawk outside, looking at the rats. He was flustered, because Craggs does not do well with nature. People followed him out onto the fire escape and there it was, perched on the fire escape of the Bowery House hotel behind our building, right beside a mop hung up to dry: a juvenile red-tail, mottled brown and white, puffed up against the cold. "Dirty bird!" Craggs said, cringing into his hoodie and backing away. "Dirty bird!" There were rats running everywhere out there. The top floors of the Bowery House are a boutique hotel for people who want an upscale slumming experience, in the heart of New York's old down-and-out district; the lower floors are a flophouse for people who are still down and out. The rats were scurrying across the first-floor roof, crawling under tarps and pallets, going in and out under the doors. Some of the rats were twice the size of the others, brown and glossy. The hawk watched the rats. Sometimes it hitched its wings up in agitation or excitement, then settled down again. There were too many rats to keep track of, and they kept ducking into shelter. The rats ran across the open expanse of roof and the hawk watched them vanish into the protective shelter of black plastic rat-bait dispensers. On and on it went. The hawk yawned and snapped its beak at the mop head. 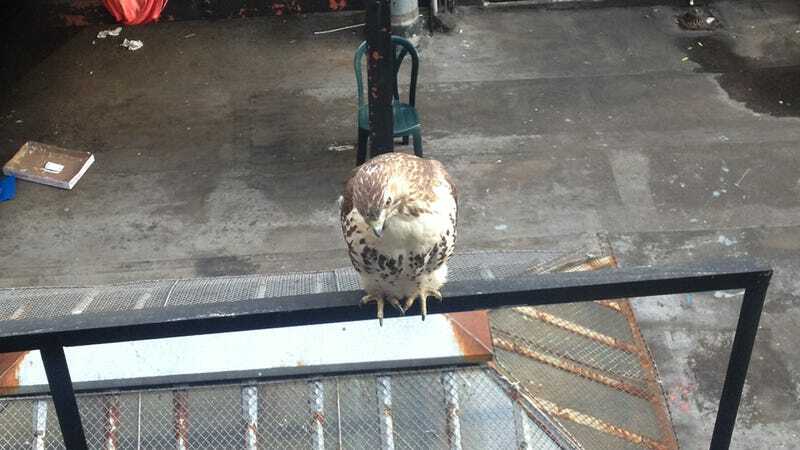 A rat walked down the fire escape stairs, right behind the hawk's back. Then another rat walked down the stairs with the hawk looking on. Those still watching began to express doubts about the hunger or the competence of the hawk. A Cooper's hawk or a sharp-shinned hawk, something built for agility in the forest, would have had half a dozen kills while this fat-winged one just sat there. The hawk flapped away, over to the next building's dryer vent, then came back to a railing even closer to the office fire escape. We crept down to the third floor. It was maybe 10 feet away. Down below us, rats were running among more crates and pallets. A tattered sheet of plastic kept moving in the wind; out the corner of an eye, it kept looking like a rat coming up our own stairway. A maid opened a door at the back of the Bowery House and brought out trash bags. She saw the hawk. The trash bags went into a pile at the foot of the fire escape, she went back in, and the rats hustled over to the trash. The plastic of the bags began to shift and twitch as the rats moved around inside. Still, the hawk did nothing about them. It lifted its tail and squirted out a burst of feces, then began poking its beak where the feces had come from, like a cat grooming itself. While the hawk's face was buried in its feces-hole, an immense brown rat walked right below its perch, an easy eight-foot drop. No one had ever seen so many rats. You could have killed a dozen rats and the rat traffic wouldn't have abated. If you were using a pellet gun, that is, you could have killed them. If you were using a hawk, bupkis. The last stragglers gave up on the hawk. The hawk was a fraud, an underachiever. Then, a while later, Koblin went out for a cigarette. He came back in and announced the hawk had done it. By then, he said, the hawk had gone back to the Bowery House fire escape, and positioned itself on a rail right above the trash bags. It sidled along the rail, Koblin stopped paying attention, and: boom! Flapping wings, a scuffle, the shriek of a rat. The hawk was back on the next building's balcony, on the wooden rail. It was nuzzling around its feet. Then it lifted its head, and the rat was dangling there. Craggs staggered backward, moaning something about how disgusting it was, the most disgusting thing he had ever seen. The rat was limp and dead. Given all that time and choice, it seemed as if the hawk could have come up with a bigger rat.